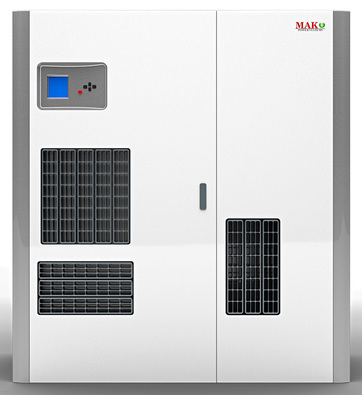 Mak Plus Power Systems Germany UPS-MAK series three phase 300 kVA UPS uninterruptible power supply has been designed for industrial applications that need small footprint and easy to install in your facilities. The 300 kva UPS three phase uninterruptible power supply is high efficient and robust solution for your electrical loads and systems. The 300 kVA ups is designed and controlled with DSP. The 300 kVA three phase UPS produced in Germany with highest IGBT technology. Our three phase 300 kva UPS is without transformer and using advanced high 2015 technology. UPS-MAK B series (Germany) 300 kva UPS are true on-line double conversion topology with high frequency power solution, the systems supported with bypass thyristor and manual bypass, manufactured with the state of the art, DSP Control, PWM and IGBT technology, producing DSP microprocessor controlled to create perfect output that pure sin wave output. UPS-MAK Series (Germany) three phase 300 kVA industrial ups protects and supports systems such as advanced local networks, industries, hospitals, advanced local networks, communication systems, medical devices, measurement devices for engineering purposes. The three phase 300 kVA UPS solutions that we give are highly efficient solutions designed in Germany. The three phase 300 kVA three phase UPS solutions are designed in Germany and produced in Europe according to European standards. The three phase industrial 300 kVA UPS is highly recommended to be used for your application. Because the electrical distortions can create for your company economical loses. But when you use an UPS that is 300 kVA and is important for your production. The cost will be pay back in some years. The electricity quality will also increase your machines life time minimum 3 - 5 years more. So 300 kVA three phase UPS is an highly cost effective option for your electrical supply. Because the UPS is not only producing electricity also cleans the electrical dirt and also supply energy with voltage regulated. The energy perfect as you loads need for maximum industrial 300 kVA nominal. Our clients and users are needs international trainings also in your field. All of clients needs free of charge pdf documents for your webpage to start marketing easily. The most common used general categories of modern UPS systems is on-line. An on-line three phase 300 kVA industrial UPS uses a "double conversion" method of accepting AC input, rectifying to DC electricity with power electronic parts for passing through the rechargeable battery and battery strings, then inverting back to 120 V / 230 V / 400 V AC for powering the protected electrical loads. The output frequency of the three phase 300kVA UPS is 50Hz or 60Hz. The solutions also can be used in USA or Saudi Arabia or latin countries. We provide solutions till 4000 kVA also customised and industrial / military solutions. Please do not hesitate to contact us anytime.